Just got back in from a two-week road trip into Chile and up the Carretera Austral, with a bit of a side-step over to see the island called Chiloe. It was a long road trip, with over two thousand kilometers wrapped onto the odometer of the Hilux, and a lot of gravel crushed beneath the tires. We started out crossing the pass at Futaleufu, just down the river from Trevelin, and had the usual silliness getting across the border into Chile. Sometimes it seems those guys (on both sides, I’ll admit) haven’t gotten the message yet that it’s no longer Pinochet’s highway. I am always reminded at these crossings, when the “inspection process” has gone on just about as long as I have the patience to allow it, of when Rishi Kaneria and I were attempting to clear customs once in New Delhi back in 2003. It was the same kind of ridiculousness, and just seemed to go on and on with no real end in sight, but when Rishi had had enough of it he just said to me in English something like “Come on Justin, let’s go”. I looked at him and then kind o f glanced at the soldiers and their shouldered machine guns and their pistols, making a face that meant something like “Really, are you sure?” But that was that, we walked away and nothing else happened. The process and the mandate of it was all just a show, and if you call their bluff then you win. I haven’t found that this always turns out to be the case down here as well, but it’s a temptation every time. 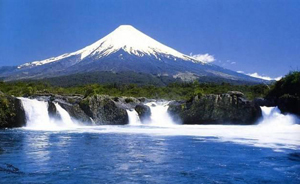 Once we’d hit the Carretera I was actually into new territory more or less right away. On my walking trip I had crossed into Argentina from the West down near Rio Pico, then seen the road from Futa on down south at another point on another trip with clients, but this was my first time turning North here. We were on Tompkins’ land again, driving up through rich forests and crossing glacial-cut rivers on our way to the recently volcano-destroyed town of Chaitén. Well, destroyed might not be the right word, but severely worked over we can call it for sure. This was actually the same volcanic eruption that I posted about back in May of 2008 when I was on my walking trip, and ended up wading through the ash fallout with my backpack for several days. When that happened here was that so much hot burning ash started falling out of the sky the town had to be evacuate completely, and the river that flows through it and to the bay flooded everything nearby with a mixture of rapidly melted glacier, lava, pumice and mud. 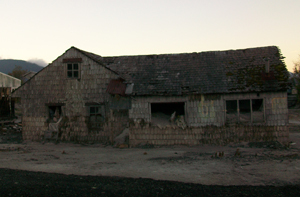 Today, the town has maybe ten percent of its population back in place, but most of the buildings that were left standing after the eruption sit filled to the gills with ash, and the place maintains a look of abandonment even at the same time as rebirth in the wake of disaster. The ocean looks just fine, and the mountains around town as well, including the sharp profile of Corcovado to the south, a stately peak recently featured as the centerpiece of Woodshed Films’ production 180° SOUTH, a film about some more “Conquerors of the Useless” (quote, Yvon Chouinard – one of my personal heroes). The mountain is really impressive, and to me this striking contrast between the durability of nature and the relative fragility of humanity’s manipulations of it is made quite clear between foreground and background as one looks out across the ruins of this town and to the beautiful horizons beyond. From there we continued North up into more of Tompkins’ land, crossing Parque Pumalin in the process, and driving over lots and lots of small streams that looked fishy to me but unfortunately not stopping to find out whether or not they were in fact fishy due our date for some salmon fishing in the Rio Puelo that we were already running late for. Travel in Chile anywhere south of Osorno necessarily starts to involve boats, and we boarded our first of these at Caleta Gonzalo, but by the end of the day still reached Puelo and settled into our cabin for the night. Fishing the Rio Puelo there near its outlet was an interesting experience. I’ve not had much experience with salmon, but have enjoyed what little I have had very much, and this was no exception. Sal Bruno and I fished a whole day on the river in some pretty cold, rainy conditions, but the salmon were absolutely thick around us the entire time. Sal got the biggest of them that we boated, and although we didn’t weight the fish I would guess it went better than twenty pounds or so. That one was released, but a smaller, brighter fish from earlier in the day was turned into sashimi and baked filets that night at the cabin and enjoyed, as Solzhenitsyn might say, with relish. Leaving Puelo we continued North again to Saltos del Petrohué, a site within Vicente Pérez Rosales National Park for a bit of a walk around and sight-see, then cut down through Puerto Montt to Chacao, and yet another ferry onto the island of Chiloe. I had been unable to find much information on the fishing available on the island, which intrigued me in a way, and had been interested in visiting it ever since hearing about a trip my late friend Betty from Los Antiguos had made here back in 2009. 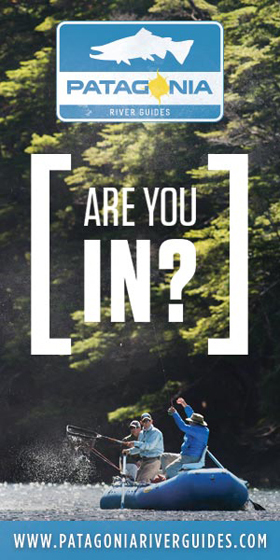 The island turned out to be interesting, in many ways, but sport fishing cannot honestly be counted among them. Salmon farms are literally everywhere you look, spread across all the bays and in every protected spot along the coast, to the point that we even encountered them in some of the inland freshwater lakes. Sal wanted to learn more about how they work, so we stopped by one and asked for a tour, but were sent on our way rather rudely by the foreman without further explanation or adieu. Oh well. 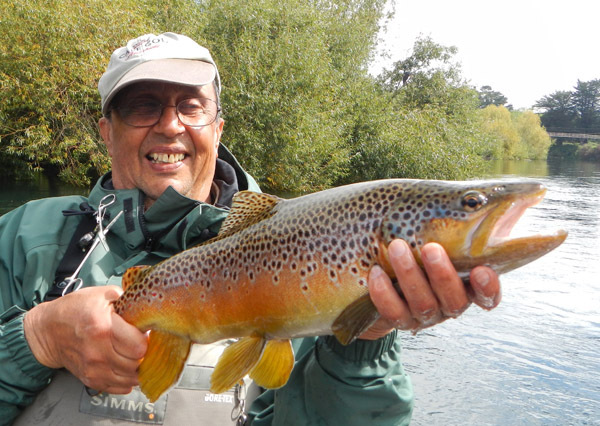 We did catch a few salmon, a very few, but the biggest among them was probably twelve inches long, so not much to speak of in terms of sport. Still, they go well with wasabi and soy. 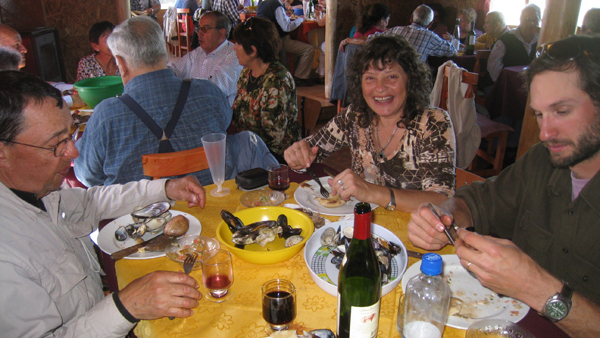 Traveling further South into the island we were fortunate enough to be invited to a traditional Curanto, or seafood bake. The Curanto is an ancient form of cooking seafood, dating back at least 6,000 years on the island of Chiloe. 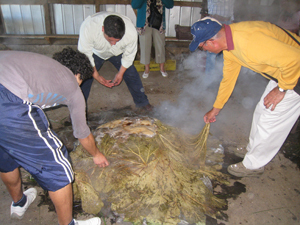 It is prepared by placing hot coals in a pit, then layering various types of shellfish, vegetables, and other meats atop them between layers of leaves from the Nalca plant, a sort of giant native rhubarb, and letting the whole thing bake under a covering of dirt, sod, and stones for several hours. I am here to tell you that this is some incredible stuff. We ate so much we could barely move! Those of you who know me I am sure are not surprised. One of the other cool things we found on the island was this wooden boat building operation. It was an unscheduled stop, found at the end of a side-road off a side road taken during the trip back up the east coast towards the port, but it turned out to be one of our favorite finds of the trip. Sal and I are both pretty heavily into woodworking, and my entry to that medium came in the form of a boat, so when we saw what looked like huge piles of shavings and the skeletons of large craft sticking out of a valley as we came down this hill, we made a bee-line in that direction. Luckily for us, the owner and head craftsman of the shop was standing outside talking to some other locals, and told us to just make ourselves at home and have a look around. What a place! 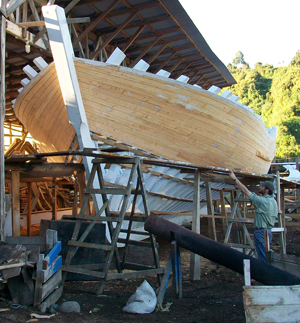 They build fishing vessels, mostly, and almost entirely from cypress, a wood it would be difficult to afford building anything with most other places in the world. There were plenty of modern tools around, but a lot of ancient looking home-made and simple hand tools too. What we didn’t see much of was anything to measure with. But from the look of the precision angles, radius’s and tapers on the wood we saw in process, these craftsmen’s eyes perform like long-range 3d calipers all on their own. After that there was a boat-trip visit to see some penguins (oddly enough, my first ever; I’m told they do not in fact taste like chicken), and then we hit the road. Heading North again off the island and up towards a bit more fishing we stopped first in the coastal town of Valdivia, to show Sal the neat seafood and fruit market we’d found a few years ago and have dinner at the Kunstmann brewery with Tweed and Marcela. At lunch there I encountered this neat painting too, which I badly wanted to buy, but it had already been sold to someone else and was no longer available. 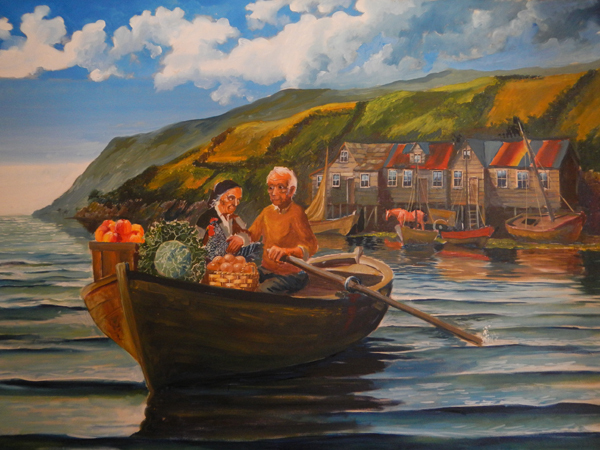 The expression on the two characters’ faces are really something; makes me think the old man may have said something about going fishing that day, but ended up rowing vegetables home instead. You gotta earn your Love I guess, all over the world. Last but not least we fished the Rio Rahue and its tributaries for a couple of days, floating it in a cata-raft with Rio Gol Gol’s owner and head guide Juan Carlos Barrientos. 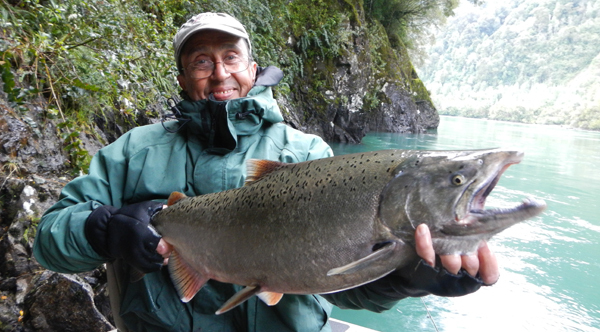 Sal, as usual, ended his trip with one last really nice fish caught on the last cast of the day, and with that we headed back across the pass and through the ash to Bariloche. 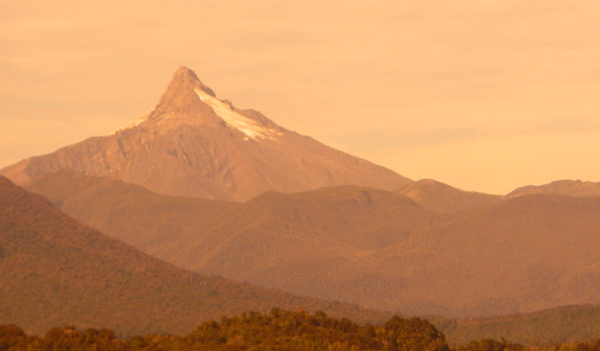 I am happy to report that Bariloche itself has more or less recovered from the aftermath of the eruption, but the ash and damaged forest between there and Osorno is still a surreal sight to say the least. More folks are coming in next week for Rio Pico and I’ll be out on the water and at the oars pretty much from then until the end of April. I hope everyone is doing well out there and that some of you will find the time to write me an email and let me know what’s new wherever you are sometime soon.